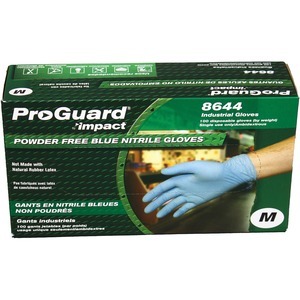 Powder-free, nitrile gloves feature a textured design to help you keep a firm grip when handling wet and dry objects. Puncture-resistant material provides increased strength for safer use with sharp items. Beaded cuff prevents rolldown for comfortable use during extended periods. Disposable design allows quick, simple cleanup after each use. Ambidextrous construction fits comfortably on either hand to prevent you from spending time looking for the correct glove. FDA-compliant, size-medium gloves are perfect for lab work, chemical handling, small parts handling, food preparation and more.